When it comes to marketing your dental practice with search engines, you have two options to choose from – SEO or PPC advertising. Both these search engine marketing strategies have their pros and cons. In an earlier post I have discussed the benefits of PPC advertising with Google Adwords. In this post we will go over the benefits of SEO for dentists and then discuss how both SEO and PPC can complement each other to create a solid dental marketing plan. The main benefit of SEO is it’s long term residual value in that the work you perform today will continue to deliver results for several months and years into the future. In that sense, SEO is like investing money into the future search traffic of your website. However, like any investment, SEO has a payout period and in case of most local dental websites it would be around 3-6 months before you start seeing significant search traffic resulting from your SEO campaigns. When compared to PPC advertising, the main benefit of SEO is that it has no per click/visitor fee unlike PPC where you are charged for every click. A PPC campaign is more like a current expense where the money you spend on clicks is gone forever. The moment you stop spending, all the traffic and patients you were getting form the PPC campaign will also stop. Whereas, with SEO, once you obtain good rankings, you can hold them for some time without any spending anything on SEO during that period. Therefore, in the long run say in 12 months period, SEO will have a better ROI than PPC advertising (and most other forms of advertising). 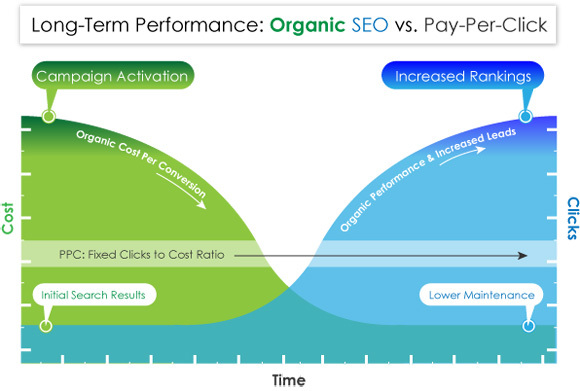 The cost per patient acquisition from PPC advertising remains constant over time while for SEO it reduces with time. Another benefit SEO enjoys over PPC is that dental patients trust organic results more than PPC ads. This fact has been confirmed through multiple surveys where consumers rate organic results as more credibile than the search ads. Therefore, if you want your practice to appear more trustworthy than another local dental office who ranks well in organic search results, then you need to invest in SEO to compete with them. Given the above facts, we can safely conclude that SEO is not an option but almost a necessity if you want to consistently generate dental patients online. But what to do with the first 3-4 months of SEO when there is no search traffic. This is where PPC advertising campaign can help fill the gap. You plan your search marketing strategy to generate a minimum number of new patients per month – let’s assume this target is 30. In the beginning, SEO will not be generating any traffic. Therefore, you have to run a PPC advertising campaign to generate all 30 patients. As your SEO traffic grows over the subsequent months it will start generating new patients. That is when you can start cutting back on your PPC advertising spend since some of the targeted 30 patients/month is now being born by the SEO work. Eventually off course you want to be in a situation where all 30 patients are being generated by SEO alone and you do not need any PPC advertising to meet your external marketing target for new dental patients. A) You stop the PPC campaign and continue investing in SEO. This is perfectly normal and if you are happy with the number of new patients you generate with SEO then so be it. Just remember that a competitor may take your advertising spot. B) You revise your new patients per month target upwards and continue with the PPC advertising campaign. If you want to get even more new dental patients and cant wait for your website to gain rankings on additional keywords, then PPC advertising is the way to go.